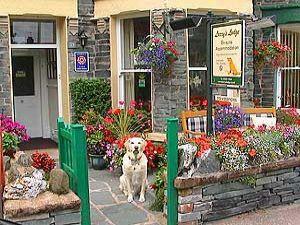 Welcome to Larry's Lodge, Keswick. Traditional Lakeland slate Victorian guest house. Quiet location. Some rooms with fell views. Exclusively non smoking for your comfort. Guide dogs and assistance dogs welcome too. Situated 12 minutes walk from The Theatre By The Lake and Derwentwater lake. Nine minutes from town centre, bus station, shops, cafes, bars and restaurants. Larry's Lodge limits bookings to 3 or more days. From M6 follow Keswick signs, turning left onto Penrith road at Conservative Club into Greta Street. Continue past the laundrette. Larry's Lodge is on the right hand side opposite Homethwaite house. By bus: go to the Tourist Information Centre, walk past cinema, left at Battersby Hall into Church Street. Left at Homethwaite house. Larry's Lodge is on left-hand side next to Squirrel Lodge. Hello David.We did enjoy your company and do look forward to meeting you again in the future. Sue, Dave, Kyle and Theo.